Better communication, better execution, better confidence — and it all led to a better result for Team Canada Sunday morning at the 2019 LGT World Women’s Curling Championship. 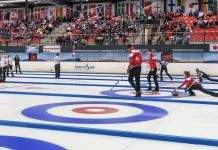 Canada’s Chelsea Carey team from Calgary scored a big four in the fifth end and sailed home with an 8-5 win over Germany’s Daniela Jentsch Sunday at the Silkeborg Sportscenter. The result left both teams with 1-1 records, but the win for Canada was more important from a confidence standpoint after a disappointing 7-6 setback to South Korea on Saturday night. “It was huge to go out there (today) and get some confidence,” said Team Canada vice-skip Sarah Wilkes, who shot the lights out with a 95 per cent performance against the Germans. “It’s massive for our team; to get out there and have an idea of what the ice is doing and be a little more comfortable out there, less stressed, it’s definitely huge for our confidence. For four ends, the struggles of Saturday night seemed to be carrying over as Canada found itself down 2-1 after Germany stole a point in the fourth end when Carey was wide with her last-rock tap attempt. But in the fifth, it was sheer perfection from Team Carey — seven perfectly executed shots, and when Jentsch’s last-rock freeze attempt bounced into the open, Carey made it eight in a row with the open hit to score a game-turning four. And, potentially, a tone-setter for the Canadian team, as it went a long way toward erasing any lingering disappointment from the Saturday night loss. The Canadians will return to action later on Sunday against Latvia’s Iveta Stasa-Starsune (0-2) at 2 p.m. (all times Eastern).